Abstract: The two-century period prior to the publication of Newton’s Principia (first edition 1687; third edition 1726) was most important in terms of the radical changes that occurred in the observation, perception, and understanding of celestial objects that in turn spurred Newton to deduce his laws of gravitation and motion. Surprisingly, much of the available observational data embedded in contemporary texts from that two-century period has remained unused by modern astronomers, and this thesis (a) describes large amounts of data that were found and reanalyzed during the course of this Ph.D. research project, (b) places these data and their resulting analyses in context with the astronomy of the early-modern era, and (c) shows how modern astronomers and historians benefit from such information. The emphasis is placed here on west-European observations, as observations made elsewhere (eastern Europe, Asia) were isolated (not communicated for convenient rapid use by contemporary astronomers elsewhere) and did not develop or employ the level of precision that was utilized by western European astronomers through the extensive discussions that developed from correspondence and publication in Europe. Introduction: Several generalizations can be drawn from observations of comets that were made prior to the efforts at explaining them through the work of Tycho Brahe, Isaac Newton, and Edmond Halley : (1) comets were seen to be different from the planets via their motions on the sky and via their inexplicable and sudden appearances and disappearances; (2) comets were often and even generally seen in an astrological sense, in that they influenced (for better or, usually, for worse) the activities of mankind; and (3) comets were often linked with meteors, though both were phenomenena that were beyond certain explanation. 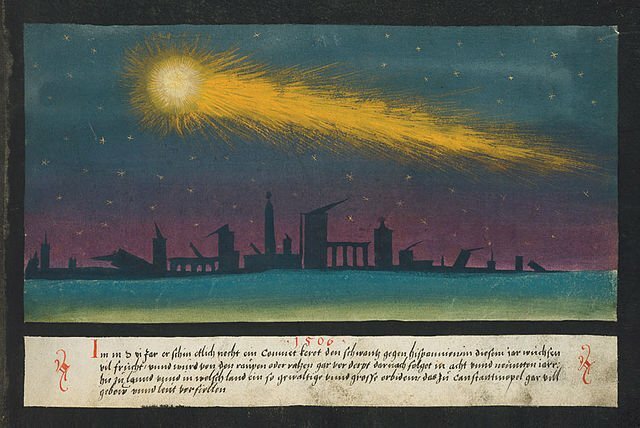 Because of these perceptions of comets, it is important to understand all this in the context of observations being made in the late middle ages and early-modern era – the focus period for observations analyzed in this thesis.